We all know the common skills we need for jobs. But there are some skills which might not be very common though they can help us get a lot of success in our work as well as personal life. Everyone loves to talk a lot. But very few people are good listeners. And if we become good listeners, we might be able to avoid a lot of problems in our life. Apparently, we are listening but when it comes to applying what we were listening, we get all blank. One of the reasons of being blank is because we listen to reply. This makes it hard for us to follow the instructions. Following instructions is another very important skill. Following instructions saves our time and effort. Rather than doing a mistake and doing the task all over again, it is better to follow the instructions and do it once properly. Following instructions is important anyway but following instructions in work place means a lot. Work places do not have a lot of room for mistakes. Guidelines that we follow to conduct a process act as standards and they help us achieve success in life by reducing the learning curve. Companies train their employees to follow instructions. Inability to do so can result in losing out on important clients. Recently, your manager has bought it to our attention that you have not been following the instructions properly. You are one of our best employees and we highly regard your hard work. We know you have a wonderful skill set and work experience. But following instructions is very important no matter what. The instructions provided to any employee are meant for their own benefit. These instructions will help you achieve the required learning curve and improve your productivity. 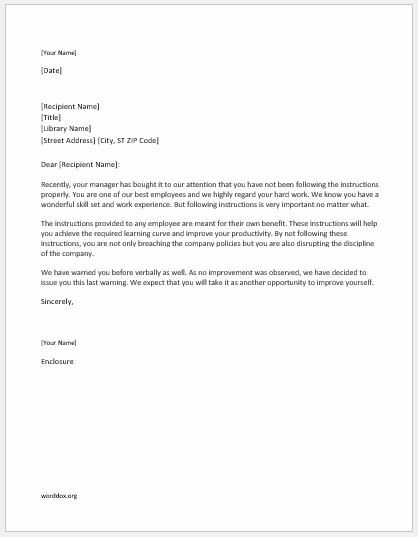 By not following these instructions, you are not only breaching the company policies but you are also disrupting the discipline of the company. We have warned you before verbally as well. As no improvement was observed, we have decided to issue you this last warning. We expect that you will take it as another opportunity to improve yourself.